1 Preheat the oven to 210°C, 200°C fan, Gas mark 7. 2 Roast the chicken fillets for 20 minutes, turning occasionally until cooked through. 3 Meanwhile, place the carrots and pumpkin in a roasting tin. Add the garlic and rosemary and drizzle with oil. 4 Roast the vegetables in the oven for about 20-30 minutes until cooked and starting to colour. Remove the garlic and the rosemary. Set aside to cool. 5 Add the pumpkin seeds to a baking tray and roast for 3-4 minutes. 6 Cook the couscous according to the instructions on the pack and cover with cling film. Cut the cooled chicken into cubes and place in a large mixing bowl, add the vegetables, pumpkin seeds, Hellmann’s Honey & Mustard Dressing and the chopped herbs and mix really well. 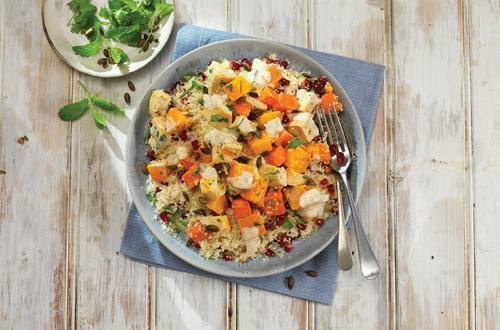 7 Fluff up the couscous and add the pomegranate seeds. 8 Serve the salad on top of the couscous.